Now why would we choose such a topic for “Horizons”? No reason! Shut up and read! Fashion in the period 1700–1750 in European and European-influenced countries is characterized by a widening silhouette for both men and women following the tall, narrow look of the 1680s and 90s. Wigs remained essential for men of substance, and were often white; natural hair was powdered to achieve the fashionable look. Distinction was made in this period between full dress worn at Court and for formal occasions, and undress or everyday, daytime clothes. As the decades progressed, fewer and fewer occasions called for full dress which had all but disappeared by the end of the century. Men continued to wear the coat, waistcoat and breeches of the previous period for both full dress and undress; these were now sometimes made of the same fabric and trim, signalling the birth of the three-piece suit. Coats were roughly knee-length throughout the period. By the 1720s, the skirts of the coat had pleated panels inserted in the side seams; these were occasionally stiffened to increase the fullness over the hips. Coats had no collars early, and a short standing collar later. Oversized, turned-back cuffs extended to the elbow. Waistcoats remained long. Full dress coats and waistcoats were trimmed with lace, braid, or heavy embroidery; undress clothing had a similar cut but without the trim. The frock was an English undress coat with a wide, flat collar, derived from the coats worn by working men. Wigs in a variety of styles were worn for different occasions and by different age groups. The large high parted wig of the 1690s remained popular from 1700 until around 1720. During this time various colors were worn, but white was becoming more popular and the curls were getting tighter. Later, wigs or the natural hair were worn long, brushed back from the forehead and clubbed or tied back at the nape of the neck with a black ribbon. A bag wig gathered the back hair in a black silk bag. Wide-brimmed hats with brims turned up on three sides into tricornes were worn throughout the era. 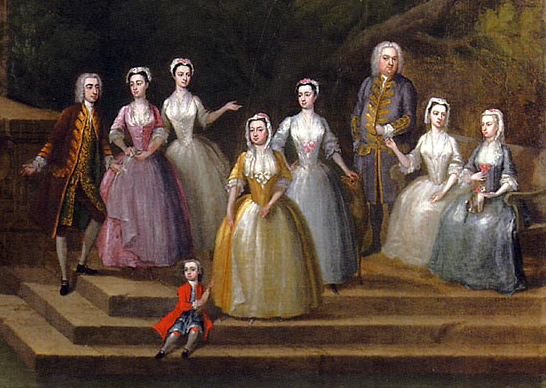 The period was known as “Enlightenment to Regency” and it stretched from 1700 to 1820. In the early years of this period, black silk hoods and dark, somber colors became fashionable at the French court for mature women, under the influence of Madame de Maintenon. Younger women wore light or bright colors, but the preference was for solid-colored silks with a minimum of ornamentation. Gradually, trim in the form of applied lace and fabric robings (strips of ruched, gathered or pleated fabric) replaced the plain style. Ribbon bows, lacing, and rosettes became popular, as did boldly patterned fabrics. A mid-century vogue for striped fabrics had the stripes running different directions on the trim and the body of the gown. Chintz, Indian cotton fabric with block-printed imaging on a white base, was wildly fashionable. Bans against their importation to protect the British silk, linen and woolen industries did nothing to reduce their desirability. Brocaded silks and woolens had similar colorful floral patterns on light-colored grounds. Blends of wool and silk or wool and linen (linsey-woolsey) were popular. Pirates also followed the style. If you would’ve lived in that period you could clearly have seen changes to their hats (which now have feathers or “puffy” ornaments) and their clothes (especially color-wise).